WHY SHOULD YOU ATTEND METALCON? Metal building, residential and roofing contractors, architects, engineers, developers, facility managers, fabricators and building owners from the US and abroad. Attend because it’s the only show of its kind in the world! Editor’s Note: As we gear up for METALCON International, Oct 1-3 in Atlanta, we’re highlighting some of our favorite Atlanta metal construction projects. We hope to see you next week in Atlanta! Sports arenas, event centers and skyscrapers generate the most buzz around their construction. Other buildings, such as schools, may not enjoy the limelight, but they’re no less important. In fact, one could argue the design, planning and function of a school building affects the future of more people than any other building type. As you tour Atlanta during the upcoming METALCON, Oct 1-3, you can’t miss metal’s contributions to the city’s famous buildings. But get off the beaten path a bit, and take note of some of the less known, yet highly influential ones. Atlanta-based Portman Family Middle School is a prime example of design done well, and metal products contribute to the middle school’s educational and green attributes. A LEED Gold-certified building, construction of the middle school was made possible by a generous $10 million donation by Jan and John Portman. ALPOLIC aluminum composite panels are central to the high-performance exterior envelope. The metal panels were chosen for their versatility, durability, modern appearance and energy efficiency. 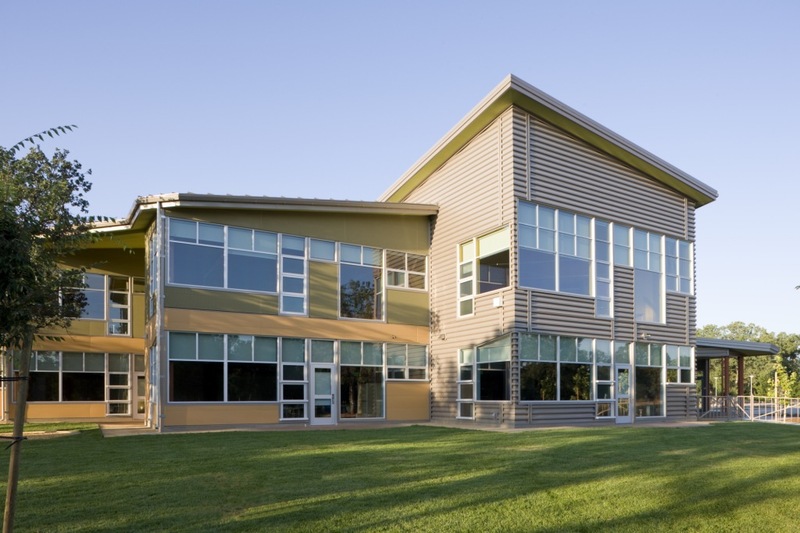 As an energy-efficient green building, the middle school not only saves tens of thousands of dollars annually, it also educates hundreds of children about the importance of sustainable living. 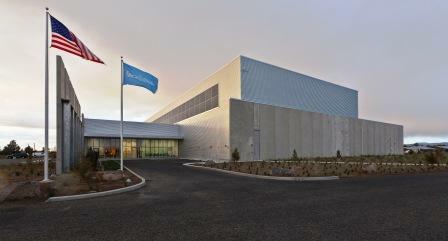 Metal’s use as a green construction material will no doubt be a hot topic at METALCON this year. 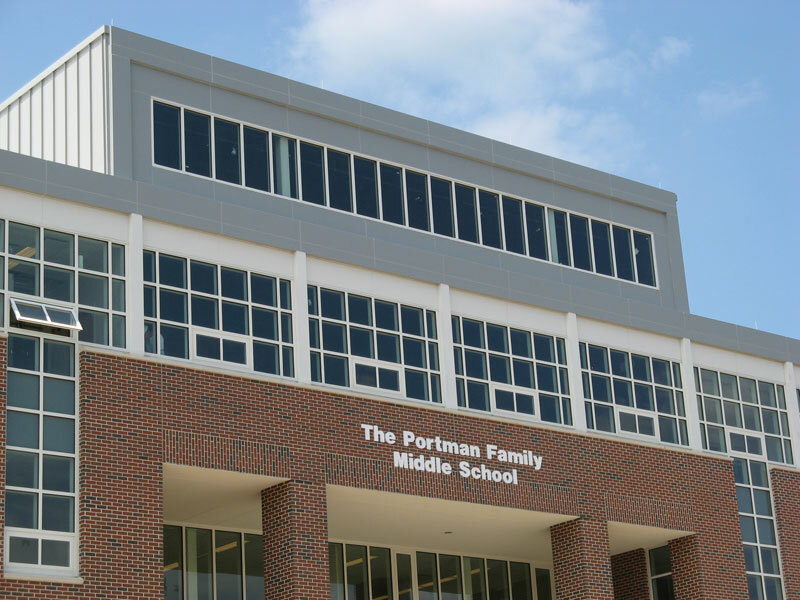 For a prime example of metal’s green attributes in action, check out Portman Family Middle School, too. 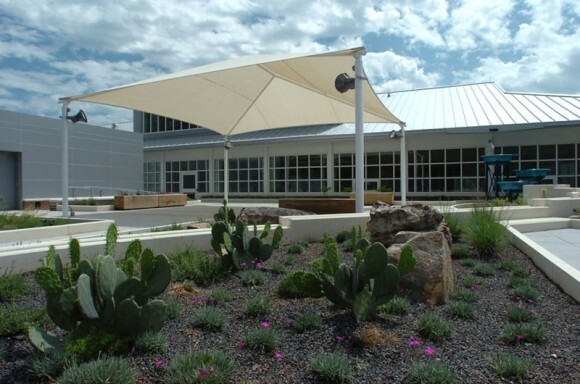 Sometimes the word “cool” can be a bit overused–but not in the case of this recent metal roof retrofit project with the U.S. Air Force’s Goodfellow Air Force Base in Texas. This roof is cool–both literally and figuratively. In 2010, a team of leading metal construction companies and the Metal Construction Association (MCA) were awarded a $1 million Environmental Security Technologies Certification Program (ESTCP) grant to develop a retrofit metal roof system with integrated renewable energy technologies, including an integrated assembly of six different roofing system components. 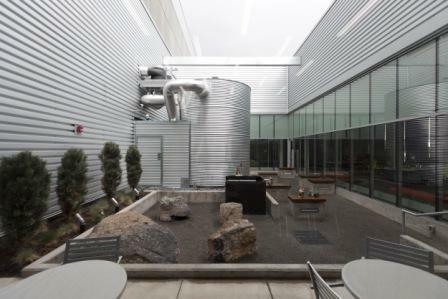 View the video above or read MCA’s case study to learn more about the project’s energy-efficient technologies, which include photovoltaics to generate electricity, solar-thermal technologies for domestic hot water and space heating, and rainwater capture for irrigation. The Department of Energy’s Oakridge National Laboratory will soon be analyzing a full year’s worth of data on heat transfer, energy output from the photovoltaic panels and water usage from the building. MCA expects that the results will be positive, and the Air Force reports that preliminary numbers how a 44-percent reduction in energy consumption. Stay tuned for the full report and results in the coming months from this “cool” project. Is RoofPoint Recognition Worth It? 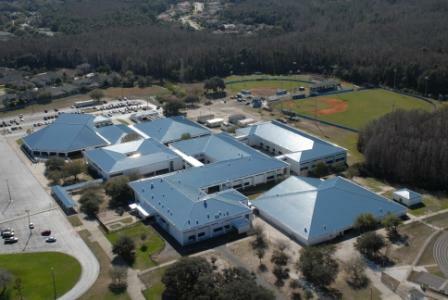 Pose this question to Robert J. Whitcomb, AIA, RRC, of C. B. Goldsmith and Associates, Inc., who served as designer on the RoofPoint-recognized East Lake High School roof-replacement project in Tarpon Springs, FL, and he will answer with a resounding yes. “Having a program to evaluate, approve, and certify our roofing work has value if just to show our clients that the design was peer-reviewed and found to be sustainable,” says Whitcomb, who, not surprisingly, plans to incorporate the same sustainable strategies used in this project on other future projects. Like many metal manufacturers, Whitcomb learned about RoofPoint only recently, upon completing the 216,283-sq. ft. high school roof and exterior-renovation project in spring 2012. After familiarizing himself with RoofPoint’s roof rating system, he applied for and received a Roofpoint certificate of recognition for the project. Whitcomb says that from the start, the school roof project was focused on sustainability, and that aim influenced all decisions, from material selection to phasing and scheduling. The high school’s new roof features a Drexel DMC 175S 0.040‐in. aluminum standing seam (snap lock) metal roof system with custom flashings and details and solar reflective roof coatings over the existing modified roofs, among other features. What is RoofPoint? RoofPoint is a voluntary, consensus-based green rating system that helps building owners and designers select nonresidential roof systems based on long-term energy and environmental benefits. It was developed by the Center for Environmental Innovation in Roofing (CEIR), Washington, DC, a not-for-profit organization focused on the development and use of environmentally responsible roofing systems and technologies. • is suitable for both low-slope and steep slope roofs, including architectural metal systems. • provides credit for thermal break clips used with many metal roofing systems. • recognizes a wide variety of roof surface colors other than just white as an appropriate cool roof surface. 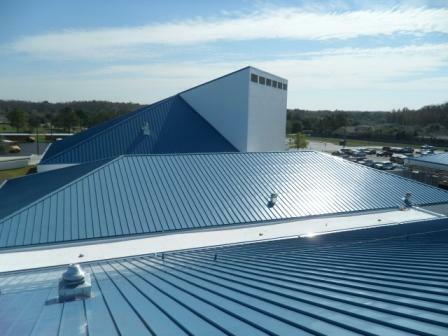 • contains credits that help recognize metal roofing’s unique durability and life cycle features. 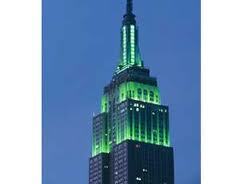 • recognizes both recycled content and material reuse, which are both very easy with metal. According to its website, RoofPoint provides a simple, transparent, and professional measure to ensure that new and replacement roof systems are designed, installed, and maintained in accordance with the best sustainable practices available today. For more information on the program, visit www.roofpoint.org. Fortune Magazine recently featured a story about Starbucks’ use of shipping containers in the design of their new drive-through coffee shops. According to Fortune, a good portion of the 900 or so drive-through locations that Starbucks plans to build in the next five years will be made using retrofitted metal shipping containers. The use and repurposing of metal shipping containers in construction is a growing trend, even though they are not always less expensive than other manufacturing methods. And re-using a metal shipping container that would otherwise be destined for the scrap heap can make a statement about sustainability, especially when used with other “green” building efficiencies. 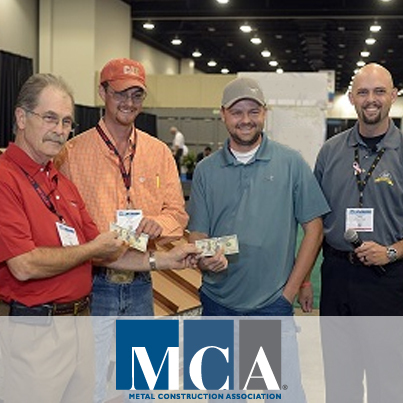 MCA’s 2012 Chairman’s Award Winner in the Education-Colleges & Universities category is a creative example of how shipping containers can be used in construction. The project, a student center for Monterrey Technical University in Juarez, Mexico, was designed by Ruben Escobar, a graduate of MTU and principle at the architecture firm Grupo ARKHOS. 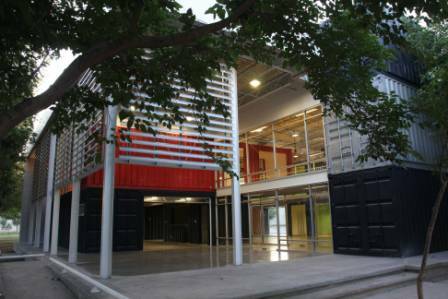 The student center uses 14 metal shipping containers to make a 7,000 sq. ft. space for students to interact socially. With exposed metal making up 80% of the new building’s structure, Escobar integrated a metal skin composed of Reynobond composite aluminum panels around the building’s entrance. 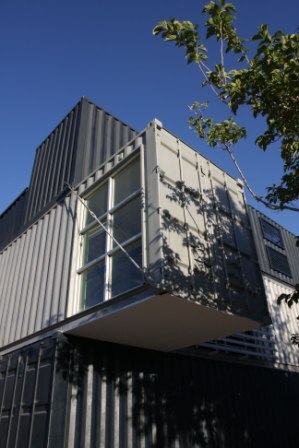 The 4-mm panels from Alcoa Architectural Products proved to be a perfect complement to the shipping containers, and also were chosen for their durability. Not only is the new building constructed primarily of recycled materials, but it also is designed to keep cooling costs low. An outdoor paint scheme that uses automotive paint mixed with ceramic nanospheres helps repel the desert sun’s rays, and a series of aluminum and glass garage doors open up to provide natural ventilation about 8 months out of the year. It is estimated that there are more than 17 million shipping containers in the world today. Because the United States imports far more than it exports, there is a surplus of empty shipping containers in this country. 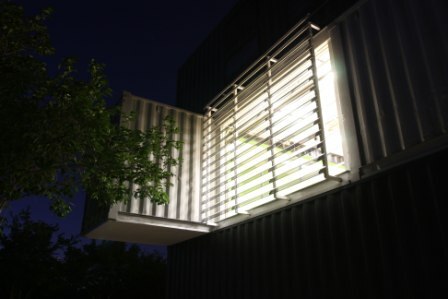 Metal shipping container-inspired architecture is just one way to give new life and purpose to these resources. 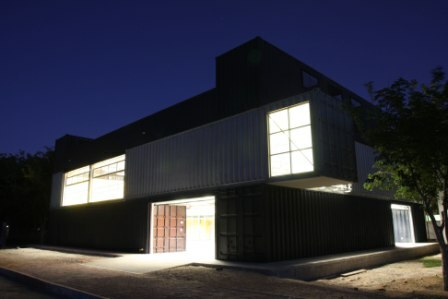 The list of design accolades for the Redding School of the Arts in Redding, CA, is impressive. 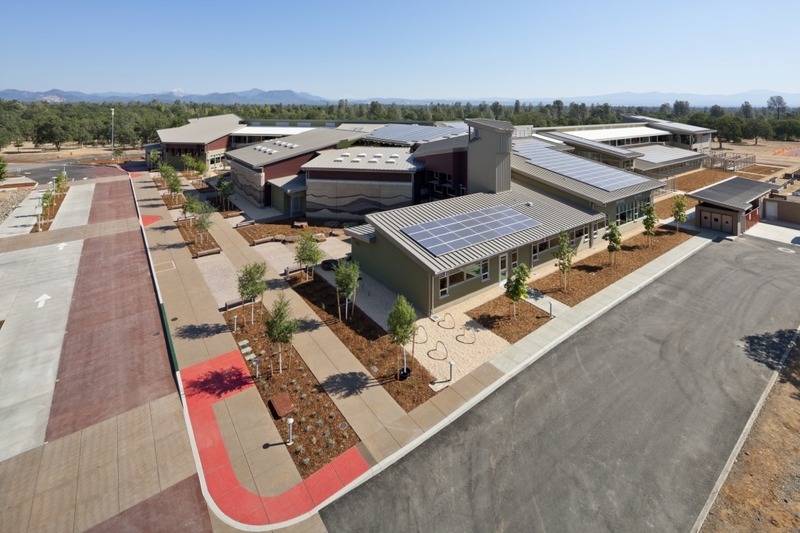 It is the first new school campus in the world to receive Platinum certification under the LEED for Schools 2009 standards, and it also is expected to achieve Net-Zero. The school is designed to achieve the Collaborative for High Performance Schools (CHPS) certification, a national movement to improve student performance and enhance the education experience by building the best possible schools. The design for the school was based on two essential ideas: First, the learning environment should create opportunities to show students, teachers and parents the importance of metal sustainability. Second, students should be inspired to learn in creative, colorful and fun surroundings. To help achieve these two ambitious functional and aesthetic goals, the design team turned to Metal Sales Manufacturing Corporation. 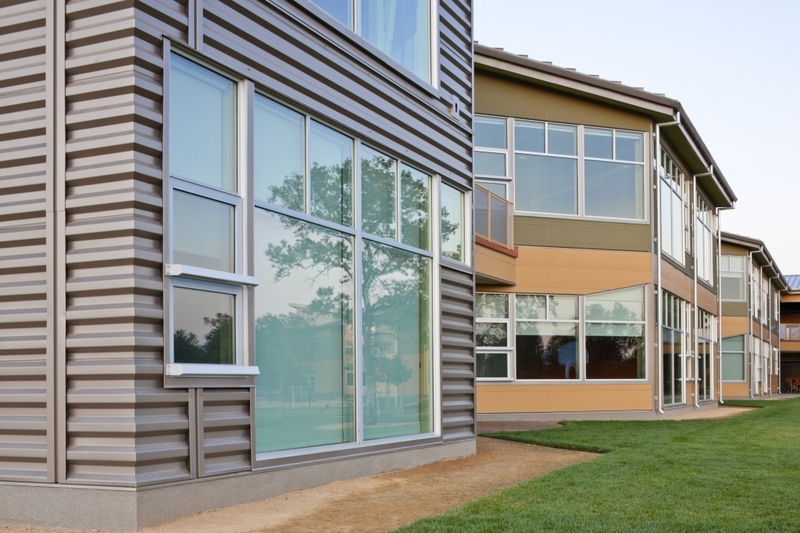 All of the metal panel colors used on the school are listed with ENERGY STAR®, improving energy-efficiency and reducing the amount of energy needed for cooling. The panels also have a long life cycle that will endure the wide temperature variations of the Sacramento Valley, are 100% recyclable, and contain a high percentage of recycled material – contributing to LEED points. The use of metal wall and roof panels helps give the facility a smart and modern look worthy of its high-profile, high performance mission. More steel is recycled annually than paper, plastic, aluminum and glass combined. I thought that was pretty remarkable. Approximately 90% of metal roofs and insulated metal panels are made out of steel, much of which is recycled content. That’s just one of the many green benefits found in metal roofs and walls. View this video to learn more: Metal Roofing and Recyclability. Attending the Energy Efficient Roofing Conference in Charlotte, NC, next week? Don’t miss Scott Kriner’s presentation on the integrated energy efficient metal roof retrofit system at Goodfellow Air Force Base, San Angelo, TX. “This Department of Defense (DOD) demonstration project is a result of the $1 million Environmental Security Technology Certification Program grant, which was awarded to a team of industry professionals representing metal roofing, retrofitting, solar technologies, insulation, and the Metal Construction Association (MCA),” said Kriner, MCA technical director. Results of the installation are expected later this year. Kriner will be presenting on Monday, April 8, from 3:50–4:10 pm. At 4:30 pm he will serve as a panelist in a Q&A session.